The internet is becoming a more competitive landscape by the second, there may be billions of users online but competiting for their attention and showcasing your services isn't as easy as it once was. The current trend for marketing to internet users is providing a native, and contextual experience and the old way of advertising is slowly fading. Creating relevant messaging and matching it with the correct user with the intent to act is a marketing formula we're all looking to crack. The better we get at it, the more leads/sales we can extract from our advertising spend. The craving for contextual and native experiences is why content marketing and influencer marketing as well SEO have become so popular over the last few years and why businesses need to start integrating it with their current marketing mix. However, If you're not willing to invest in these channels, you can still make use of Google's Ads suite to help you engage the right customers more often than not. Google Signals is a brand new feature added to Google Analytics and is currently in Beta. When you activate Google signals on your profile the following existing Google Analytics features are updated to also include aggregated data from Google users who have turned on Ads Personalization. Remarketing with Google Analytics Create remarketing audiences from your Google Analytics data, and share those audiences with your linked advertising accounts. Audiences that you create in Google Analytics and publish to Google Ads and other Google Marketing Platform advertising products can serve ads in Cross Device-eligible remarketing campaigns to Google users who have turned on Ads Personalization. Cross-Device reports (in beta) Connect data about devices and activities from different sessions so you can get an understanding of user behaviour at each step of the conversion process, from initial contact to long-term retention. To activate this beta feature, contact your account manager. Based on aggregated data from users who have turned on Ads Personalization, Google Analytics models behaviour for your whole user base across device types. The data is user based rather than session based. This behaviour modelling does not require User-ID views. When users turn on Ads Personalization, Google is able to develop a holistic view of how those users interact with an online property from multiple browsers and multiple devices. For example, you can see how users browse products on your site from a phone, and later return to complete purchases from a tablet or laptop. Because of the large volume of data generated by users who have turned on Ads Personalization, Google is able to estimate from that data the cross-device behaviour of your entire user base. By default, Google signed-in data expires after 26 months. However, if the Data Retention setting is set to anything shorter than 26 months, the Google signed-in data will respect this shorter time frame. Note: The Cross-Device reports include only aggregated data and no data for individual users is ever exposed. In addition to Google Signals users will also gain access to Roll-Up Reporting. To use Roll-Up Reporting, you need to activate Google signals for the Roll-Up Property and at least one Source Property. To ensure the best data models, you should activate Google signals for the Roll-Up Property and all Source properties. When you use Roll-Up Reporting with Google signals activated, users are deduplicated across devices, and also across the domains of your Source Properties. To report on cross-device user journeys and/or remarket to signed-in Google users, you need to activate Google signals. To activate Google signals, you need Edit permission for the relevant property. Click GET STARTED in the blue notification banner at the top of the page, or navigate to Property column and Tracking info and Data Collection and follow the prompt in the blue dialogue. Click on the information and activation panels. Read the information about Google signals, then click CONTINUE. Select the properties for which you want to activate Google signals (all properties of the account, this property only, or a specific subset of properties in the account). Click ACTIVATE if you want to activate Google signals immediately. Click DECIDE LATER to activate at a later time. 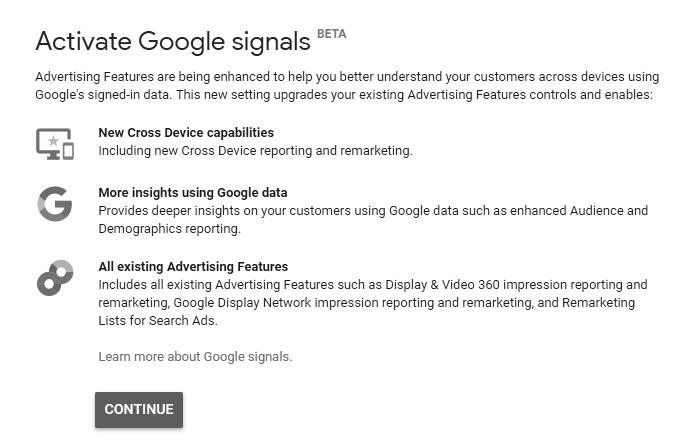 Before you activate Google signals, you also see a dismissable message (“Activate Google signals BETA”) in Analytics that provides access to the same information and activation panels. If you dismiss the message before you activate, or decide to active later, follow the preceding steps. After you activate Google signals, the switch for the feature is set to ON. Show Cross-Device remarketing ads to Google users who have turned on Ads Personalization. See new user-based data in the Cross-Device reports. Keep in mind that this new data is available starting from the date you activate Google signals. To change the setting, navigate to Property column and Tracking info and Data Collection. Note: When you activate Google signals, that control replaces the ones for Remarketing and Advertising Features. Google Signals will provide you with a deeper layer of insight into your existing customer base, allow you to isolate certain user behaviours like cross-device use and give you the opportunity to create more granular and effective advertising campaigns. Having this sort of data set can also help you find new opportunities and trends. A skilled marketer can then combine it the right messaging which can greatly increase conversion rates and reduce your cost per acquisition over time. In celebration of Freedom Day, we take a look at what the latest generation of digital South Africans think and see the new world we live in.